We recently released a few major enhancements to LinkedIn Recruiter. As a former recruiting manager who talks with talent acquisition professionals daily, I wanted to highlight three new features designed to help you be better at what you do. Imagine easily vetting potential candidates before you spend too much time tracking them down or even before you submit them to your hiring manager. Inside Opinion lets you do just that. This feature allows you to request feedback on a potential candidate from their previous colleagues who are now working at your company. No spending time thinking about who might know the candidate from a previous position – potential connections working at your company are provided on the member’s profile. It’s easy for your colleague to comment as well. They receive an InMail asking for their input with voting options – ‘Yes’, ‘No, I’m not sure’, and ‘I don’t know this person’. They can add their thoughts about the potential candidate directly in their response. Improving InMail response rates is a constant focus for our product team. With our upcoming enhancement to InMails later this week, you can now see people, experience and education you have in common with the person you’re contacting. 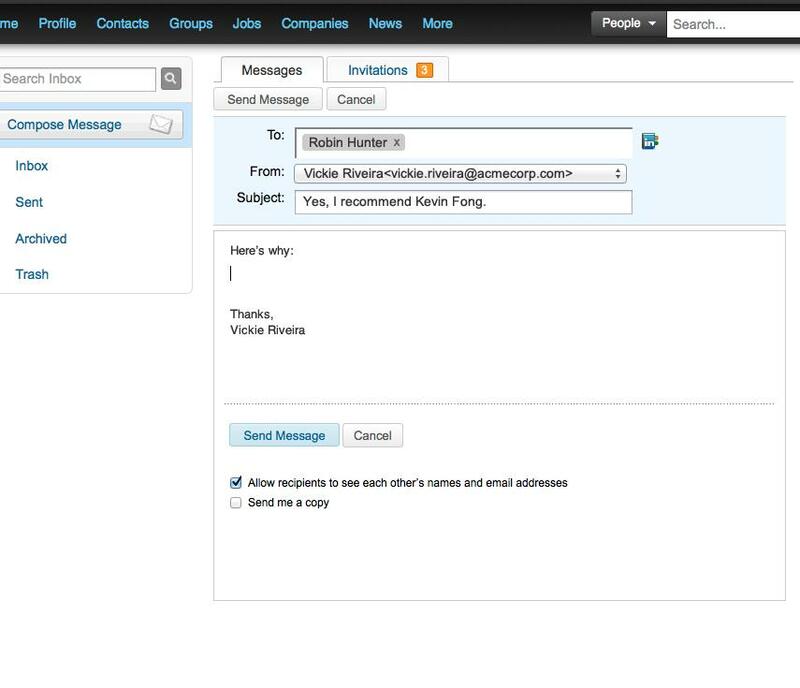 This makes it easier to personalize content while crafting InMails, ensuring a higher response rate. The recipient also sees people you have in common, adding credibility to your outreach. Additionally, it’s now faster and easier to take action within InMails. You no longer need to click into the member’s profile to write a note, set a task or reminder or add a status or tag. You can do all of this and start building your pipeline directly from a reply within InMail. 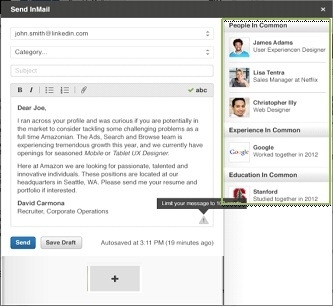 Finally, coming soon: you'll be able to send and receive attachments like applications and resumes through InMail. No more switching to your corporate email in order to get a candidate’s resume. 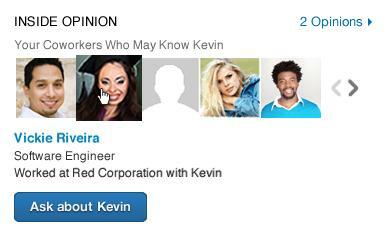 Ever wish you knew more about the effectiveness of your outreach to talent on LinkedIn? 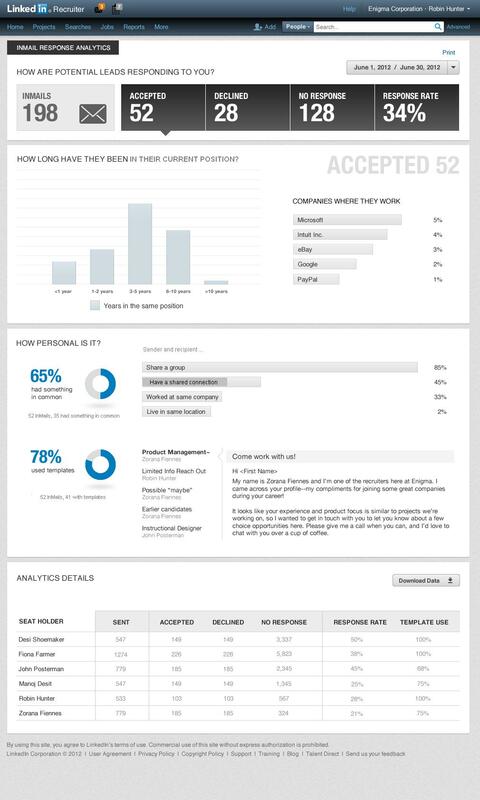 InMail Response Analytics will put more answers at your fingertips. The new report includes statistics on InMail volume and response rates, and gives more color on who’s accepting your InMails, by company and time in current position. You can also tell if a more personal InMail, through shared groups or connections, performs better, as well as track the effectiveness of templates you’re using. We’re excited to hear how these LinkedIn Recruiter enhancements increase your sourcing efficiency and effectiveness! For a full product overview, download the LinkedIn Recruiter datasheet.